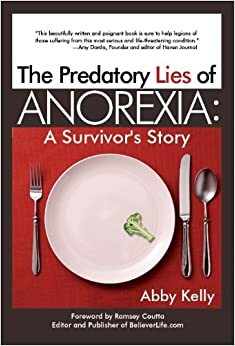 Dear Friends, I am thrilled to announce that my book, Surviving the Predatory Lies of Anorexia, will be available in ebook on all formats in January! Bettie Youngs Book Publishers will be publishing my book and stay tuned, the print copy will be available soon as well! I’m so honored to share this review of, Surviving the Predatory Lies of Anorexia, by Ramsey Coutta. Everyone has needs and wants, but imagine if yours are so deep and so strong that they lead you to self-destructive behaviors that imperil your very life. Imagine that in your profound need to be noticed, admired, and loved, you literally starve your body of the nourishment it needs to survive and thrive. Sadly, such is often the life of those afflicted with anorexia. In her compelling new book, Surviving the Predatory Lies of Anorexia, Abigail Kelly courageously lays bare her personal struggle with anorexia and the heavy toll it has taken on her life and those closest to her. She does not flinch from sharing with the reader how anorexia magnified her natural flaws causing her to act in ways that will seem inconceivable to those not familiar with this disorder. Surviving the Predatory Lies of Anorexia, spans a significant portion of Kelly’s life from when she was a teenager to the present as a grown woman married to a career military officer. She details the beginnings of her experience with anorexia and how as a teen it started as a personal choice in order to appear thin and desirable as well as a way to compete for the attention she longed for. Eventually though, the anorexia took on a life of its own to the point she was no longer able to control it, even during the rare moments she actually wanted to do so. Repeated stays at inpatient facilities and ongoing therapy with counselors brought periods of insight and healing, but inevitably relapses occurred leaving Kelly and her family feeling desperate and defeated. Marriage brings Kelly a sense of purpose and fulfillment on one hand, but on the other she experiences intense feelings of loneliness and searching. At one point, throwing herself into long distance running she once again finds the demons of her illness rising up causing her to grow thinner and thinner greatly worrying friends and family. The illness of anorexia along with the stress of repeated moves and deployments from her husband’s career eventually bring their relationship to the point of collapse. However, God is always present in Kelly’s narrative and it’s through His power that the couple are able to face their adversities together. Surviving the Predatory Lies of Anorexia, is a compelling true life story of ever shifting hope and despair in the life of an amazing woman. The reader will simply shake their head and wonder at how one person can go though such a tremendously long and painful struggle and still come out so hopeful and determined. The redeeming power of God’s love and grace is never far away in Kelly’s saga. Those who read her book will come away feeling inspired and better as a person for having been introduced to the life of this extraordinary woman and author. This review was graciously written by the founder and editor of Believer Life, Ramsey Coutta. Ramsey is a successful author in his own right and has many books available on Amazon. I will be posting an interview with Coutta in the coming weeks. CONGRATULATIONS ABBY !!! Excellent news, you must be VERY happy with that !! God is most definitely at work there and it will certainly help other people. I shall look forward to reading it ! David, I’m so thrilled. Thanks for being excited with me! God is so good! Abby, I am SO happy for you and for the way you’ve allowed God to shine through your story. I absolutely can not WAIT to read this. Please let us know where we can get a print copy!!! This is one of the most exciting Christmases ever. God has opened wide the opportunity to share my story and to offer encouragement to others struggling with eating disorders. The New Year, 2014, holds challenges and possibilities that I’ve never anticipated before. So thankful!